We have taken to heart a clear message heard from many clients during our almost 10 years in business – creative ideas are the greatest value an agency partner can provide. OSP puts this process through our own filter by ensuring ideas are affordable and executable. We make sure there is a steady cadence of ideas, whether as part of an annual planning process or – more uniquely – unprovoked idea sheets. This keeps everyone sharp and engaged. 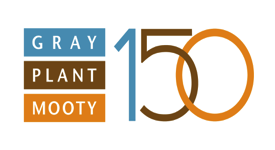 While some may have approached the 150th anniversary of a law firm in a more traditional way, One Simple Plan saw an opportunity to bring new life to a long legacy. To mark GPM's sesquicentennial, OSP recommended collaborating with Faribault Woolen Mills – another member of the Twin Cities' "150 Club" – with ties to the firm. GPM commissioned a special wool scarf from Faribault and sent it to local influencers as part of a package that celebrated how the firm has always been "woven into the fabric of the community." Notable Twin Cities personalities – ranging from media to business leaders and even a U.S. Congressman – posted pictures with the scarf to celebrate the special milestone. This theme was extended further into a special microsite and was the backbone of 2016 being a year of community service for Gray Plant Mooty – which was recognized in a Star Tribune column.